I came home from an overnight trip to town and found that Mary over at “The Curious Quilter” had written up an article about my blog, – sending lots of visitors over here. Thank you, Mary, and thank you to everyone who stopped by, and for all your kind comments. Since I have contibuted (in a very small way) to this project, I got a letter from the organizers today with information on the progress. The quilt is now finished, and is awaiting verification from the Guinness Book of Records. to see more photos of this amazing quilt. the project received rosettes from the following countries Australia, New Zealand, America, Canada, England, Finland, South Africa, Germany, The Netherlands, Norway, Hong Kong, Argentina, Cyprus, Belgium, Montevideo and Switzerland. A truly impressive piece of work! 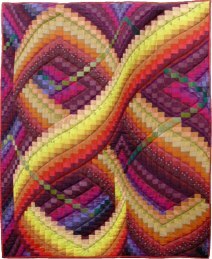 Amy, – Park City Girl, – is once again organizing the Blogger’s Quilt Festival over at Amy’s Creative Side. 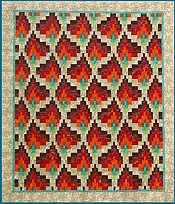 Every blogger is encouraged to show one of their quilts and link to the event. 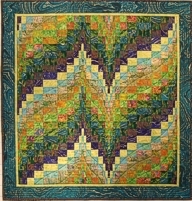 It is great fun to surfe all the different blogs and see and read about the many different quilts displayed. This year I have decided to show you a small and very simple quilt, which has some fond memories attached to it. When my mother turned 80, my eldest sister, who then lived in the north of Norway, arranged to take her along on a trip to see the Kola peninsula, and Murmansk. Since two of the original party had to cancel, my youngest sister and I were invited to join. So there we went, mother and three sisters, happily driving along the roads in the Arctic. We were able to see part of the Varanger peninsula before entering Russia, and the trip was prolonged so we also drove through Finland and Sweden and ended the trip by enjoying a week in the Lofoten area. We kept a travelling blog, and since I was appointed “official blog photographer”, I could really indulge in using my camera, and try everyone’s patience more than I otherwise would have done (perhaps). However, they all thought it went a bit too far when I wanted to photograph the fog near Ekkerøy, – and on our first day too. The fog!!? Why? My argument was that I thought the fog was decorative, – which made everyone laugh, but my sister stopped the car, and I got my photos. We had a lot of fun with the “decorative fog” throughout the trip, – my companions pointing out to me every clump of fog or mist, and as we went on, every interesting house, or flower, or green straw that I might want to point my camera at. I don’t think I have ever laughed so much in the course of two weeks as I did then. Afterwards I used some of the photos I took to make up some of my fabric panels, and chose the one from Ekkerøy to make into a small quilt for my sister, who arranged the trip. A friend of hers owns the red house in the background, which has been turned into a restaurant. I used hand painted fabric for the border, and used silver metallic for the quilting. Of course I called it “Decorative Mist”. On this page on my website I have explained more about the general inspiration for the fabric panels, and what went into the making of them. ……. . . even mystique. 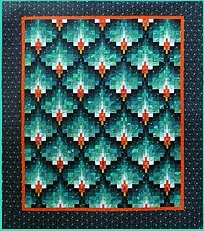 Some of my fabric panels will be given as prizes over at the Blogger’s Quilt Festival, so be sure to go to there and submit a comment on the post to enter the drawing. Yesterday I was moved from the hospital where the surgery took place, to a hospital closer to home. This is where I will do my rehab, and also they can monitor my RA at the same time. It is a 4 hour drive between the two locations, including a fjord crossing. Luckily I was allowed to go by taxi, which was very comfortable considering. It was a beautiful day. The winter still reigns in the mountain passes, while down at the fjord it was very spring like, – at least when looking through the windscreen of the car. Yesterday afternoon was spent settling in, and since my oldest daughter and family live close by, they were able to come and visit in the evening. It was lovely to see them again. A million thanks to everyone who has sent me well wishes. I have not been able to send individual replies to everyone yet, but plan on catching up as I settle into the routines here, and get my energy back. The new hip feels great, and I am more and more convinced that this one will be a success. Right now that is what I will focus on, so I can move on to other things further down the road. Op went well, and everything seems, and feels, fine. I am able to sit for short whiles, but much time is still spent resting on the bed. That is not bad either, as the view from my window is beautiful. A couple photos below. Will be back when time, and the slow connection, permits.